The law firm of Wyatt & Blake, LLP engages in a litigation practice, and focuses on defending white collar criminal investigations and prosecutions, and civil litigation. Wyatt & Blake maintain a peer rating of AV by Martindale Hubbell, which is the highest possible rating. 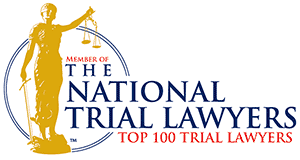 In addition, the firm has received a Tier I ranking by the national publication of Best Lawyers “Best Law Firms”. 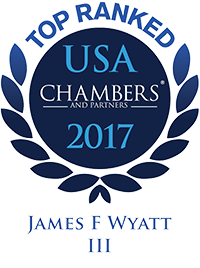 James F. Wyatt, III is recognized as one of North Carolina’s leading trial lawyers. He is a member of the International Academy of Trial Lawyers, the American College of Trial Lawyers, the Best Lawyers in America, has a Band 1 Ranking with Chambers and Partners, and has been named on numerous occasions as the best white collar defense and civil trial lawyer in both Charlotte and the State of North Carolina. 1. Integrity is our hallmark. 2. We prepare our cases thoroughly at all stages, and pay attention to every detail. 3. We recognize that every case is different and requires an individualized approach. 4. We exercise experienced judgment. 5. We let our results speak for themselves. 6. We will not be outworked by any other lawyer or prosecutor. We have handled virtually every type of criminal case that can be brought by state or federal authorities. A vast amount of our criminal defense practice focuses on white collar criminal investigations and prosecutions. Such cases include, among other cases, grand jury investigations, fraud and money laundering investigations, tax evasion, structuring of deposits, mortgage fraud, healthcare fraud, and antitrust cases. Our civil practice includes business litigation, federal litigation, securities arbitrations/trials, class action representation and qui tam cases. Click on the menu under Practice Areas for a more detailed description of our firm’s areas of practice. We are selective in the cases we accept, allowing us to obtain the best possible results for our clients.